The Gods of H.P. Lovecraft: a brand new anthology that collects the twelve principal deities of the Lovecraftian Mythos and sets them loose within its pages. Featuring the biggest names in horror and dark fantasy, including many NY Times bestsellers, full of original fiction and artwork, and individual commentary on each of the deities by Donald Tyson. About the book: Lovecraft's bestiary of gods has had a major influence on the horror scene from the time these sacred names were first evoked. Cthulhu, Azathoth, Nyarlathotep, Yog-Sothoth-this pantheon of the horrific calls to mind the very worst of cosmic nightmares and the very darkest signs of human nature. The Gods of H.P. 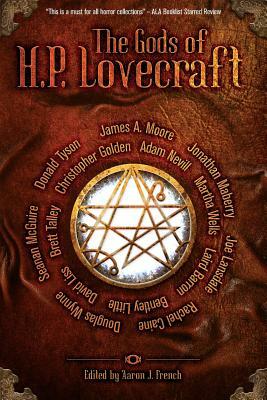 Lovecraft brings together twelve all-new Mythos tales from: Cthulhu (Adam Nevill) - Yog-Sothoth (Martha Wells) - Azathoth (Laird Barron) - Nyarlathotep (Bentley Little) - Shub-Niggurath (David Liss) - Tsathoggua (Brett Talley) - The Mi-Go (Christopher Golden & James A. Moore) - Night-gaunts (Jonathan Maberry) - Elder Things (Joe Lansdale) - Great Race (Rachel Caine) - Yig (Douglas Wynne) - The Deep Ones (Seanan McGuire) With commentary on each deity by Donald Tyson.